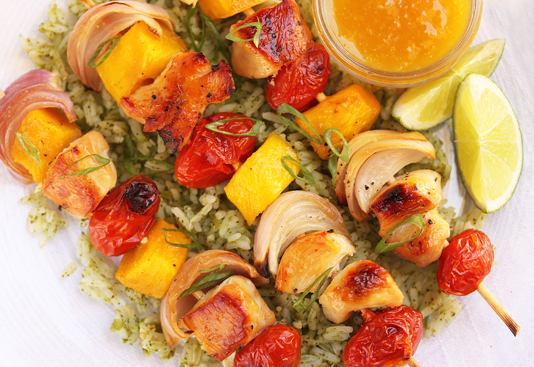 For my Mango Madness #4, I present Mango & Chicken Kabobs with Mango Ginger Dipping Sauce and Green Tomatillo Rice. This would be perfect for your Memorial Day backyard party cooking on the grill. Or in the middle of winter when you need a reminder of summer and you can roast the kabobs in the oven, which is what I did. You are probably wondering when I am going to run out of mangos, right? Well, I have one more dish that I have made and photographed besides this kabob dish. It is a Chicken and Mango Curry recipe and believe me, you are going to want to stick around for it. That’s how good it is. I am still toying with the idea of the vanilla ice cream topped with mango dipping sauce and mango-glazed bacon batons on top. Oh, and a mango liquado. And there is a Bobby Flay recipe with a bay scallop and squid ceviche on tostones with avocado mango relish. I think that might do it. I’ll have to see. I again want to thank the National Mango Board for sending me zillions of mangos. I am lovin’ it! 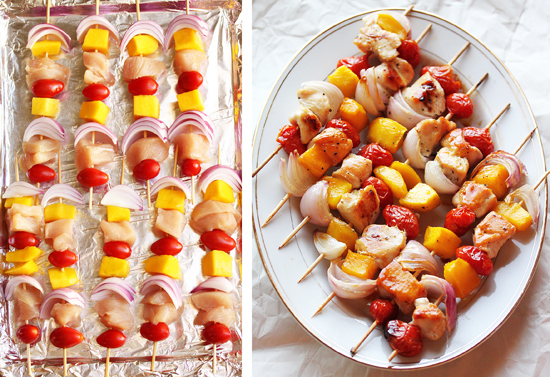 The chicken, mango cubes, onion and tomatoes are put on skewers and roasted on a baking sheet in the oven. They are brushed with honey to give a caramelized golden color. If you are using the oven method, you can run the skewers under the broiler for a couple of seconds to give the edges a little char. 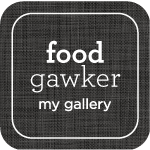 To make the green rice, tomatillos, garlic, serranos, cilantro, spinach leaves and lime juice are pureed in the processor, then folded into hot, just-cooked rice. The heat takes the raw flavor of the tomatillos and cilantro away, leaving an herb-y floral flavored rice that is especially enhanced with a little of the dipping sauce drizzled over before the kabobs are placed on top. I love the colors in this dish, orange mangos, red tomatoes, green rice and sliced green onions. When you take a bite of chicken that has been dipped in the ginger and orange flavored mango sauce, you will think you died and went to heaven. Seriously. The Mango & Chicken Kabobs can also be grilled on your BBQ. 1. Preheat oven to 400 degrees F. Line a baking sheet with aluminum foil and spray with non-stick spray. 2. Make the Green Tomatillo Rice and reserve. 3. Place all skewers on foil lined sheet, leaving at least ½-inch between. Drizzle with honey and spread to cover with a pastry brush. Turn over and brush with honey on second side. 4. Roast in 400*F oven for about 12 minutes, then turn skewers over and roast for a second 10 minutes. If chicken is not cooked through, roast for an additional 5 minutes. For additional char, run under the broiler for a minute on each side. 5. Serve over Tomatillo Rice with a small bowl of Mango Dipping Sauce, garnished with sliced green onions and lime wedges. 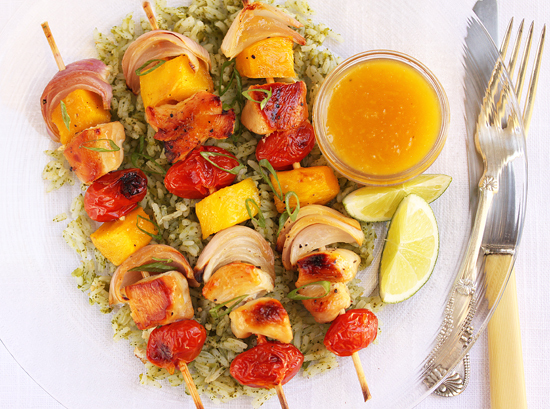 Optional: Drizzle some Mango Dipping Sauce over the rice before placing skewers on top. 1. Process tomatillos, garlic, serranos, cilantro and spinach in blender or processor until smooth. Season with lime juice and salt. 2. Pour tomatillo mixture into hot rice and mix thoroughly. Serve immediately. Note: If you are serving this rice as a side by itself in another dish, fold in a couple tablespoons of butter, or more to taste. 1. In a mini processor, combine mango, orange juice concentrate, vinegar and grated ginger. Puree until smooth. Chill. Serve with skewers. Oh my sweet friend, these look far too good. I adore mango. 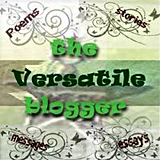 Thank you for sharing yet another delicious post with me…and thank you for your sweet words on my newly designed blog. I really appreciate your visits! I hope you are having a happy day! ious! What a wonderful post!